This incredible, new “Leo” boot from Novacas is a landmark in mens’ vegan shoes. This is what we’ve been waiting for! A simple, classic lace up boot that looks great casually half-laced with a pair of fitted jeans, or laced up completely under slacks. Thanks for setting a new standard, Novacas! Thanks to reader, Adnan for the tip! The April77 party at Oak was on the top-10 parties list (Refinery29) for Fashion’s Night Out, kicking off fashion week. 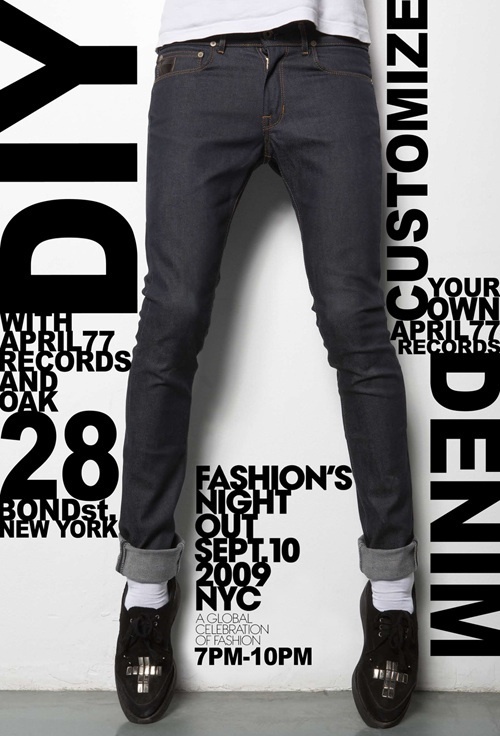 I met up with Tommy Über of April77 at OAK to chat and check out some denim customizing! The current April77 collection does have wool, but Brice personally ensured me that all future collections will be free from animal products. You are currently browsing the archives for the trend report category.